If you are a driver on the UKs roads, you run the risk of being involved in an accident with another vehicle. While it is generally hoped that all road users will conduct themselves with the necessary care and skill that is required when driving, there will always be those who fail to pay attention and cause a road accident. If you have been involved in a road traffic accident and would like to claim, please call us now for a free consultation. We help hundreds of people each year to make a road accident claim. Freephone About No Win No Fee* RTA Compensation – Our helpline is open 24 hours a day and 365 days a year. When you call us one of our friendly advisors will ask you some simple questions, and should be able to quickly tell you whether you are eligible to claim for a road accident injury claim. The consequences of being involved in a road traffic accident vary: some people emerge with only mild concussion or whiplash, while others may suffer significant injury to both themselves and their car. However, no matter the severity of your injury, if you are hurt in a road traffic accident that wasn’t your fault, you are legally entitled to road accident compensation. At Friends Legal, we help people get compensation for their injuries following a road traffic accident. Our many years of experience helping people with personal injury claims have shown us the impact that being involved in an accident can have. We work to ensure that you receive the maximum amount of financial compensation for a road accident you’re entitled to and that truly reflects the gravity of your situation. In the UK, it is expected that we will all drive in a manner that does not put other road users and pedestrians in danger of being injured. This is sometimes described in law as road users having a duty of care. While most drivers will observe the rules of the road with little difficulty, accidents can and do happen. In order for there to be any scope for you to raise a claim for compensation following being injured in a road traffic accident, you must be able to show that your injury was the result of someone failing to observe the rules of the road and breaching the duty of care that they owed to you. Evidencing a breach of a road user’s duty of care towards you is really concerned with your ability to point to something that they did (or didn’t do) which should not have been the case. In other words, you have to be able to provide tangible evidence that they did not behave as they would otherwise be expected to behave on the road, i.e. they were negligent. As a matter of law, negligence can be difficult to prove and is heavily reliant on evidence. Statements from other people that can endorse your version of events, lending credibility to your claim. It is important not to get lost in the emotion surrounding your accident, and perhaps mistakenly adding or removing information about your accident that turns out not to be true. This can have a negative impact on your prospects for success, and may cause a reduction in the amount of compensation you are entitled to. Personal injury law regarding road accident claims is designed to provide you with some financial payment that reflects the fact that you have been injured as a result of someone else’s negligent act or omission. For the most part, any compensation claim that you will be awarded will be to account for the pain and suffering that you have endured. This is often described as General Damages in England & Wales or Solatium in Scotland, which in practice relate to the same thing. How Much Road Traffic Accident Compensation? It is difficult to determine exactly how much compensation for road traffic accident claims you will be awarded, given that any and all awards in personal injury cases – including those for road traffic accidents – are designed to reflect the individual circumstances. In part, this is why it is so important that you speak with an experienced legal adviser who will be able to investigate your situation in depth and determine the likely level of compensation. Generally, the more severe the injury, the greater the level of road traffic accident compensation. Injuries, including whiplash and other soft tissue damage, may only attract a few thousand pounds –they are not significant enough to attract a larger payment, as this would be disproportionate to the circumstances. On the other hand, injuries related to spinal damage, loss of limb or brain injury can attract significantly higher sums in compensation. You should also be aware that you can pursue compensation for other aspects of your accident. Pursuing necessary medical treatment: some injuries may warrant significant medical attention, which may carry with it high treatment costs. These too can form a component of your personal injury claim. 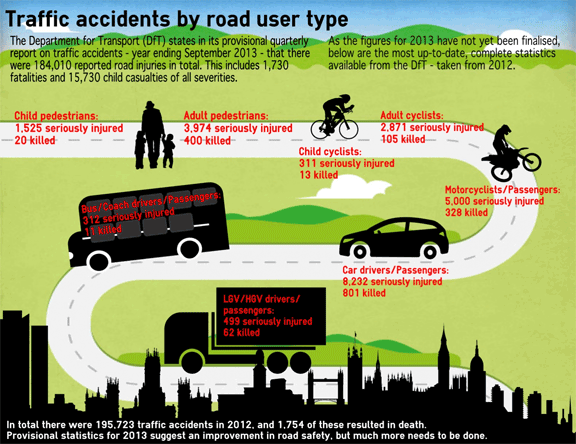 Road traffic accidents are not something that should be taken lightly. While it’s impossible to completely remove the risk of an accident occurring, everyone (pedestrians and road users alike) are expected to mitigate the risk by observing their duty of care to one another. It is for this reason and more that if you have been injured in a road accident that was someone else’s fault, then you are legally entitled to make a compensation claim using our road traffic accident solicitors. All personal injury claims should be handled by an experienced adviser who specialises in personal injury compensation claims and understands the process involved in building a strong case with sufficient evidence to increase the chances of success. Why Choose Us for Traffic Accident Claims? Friends Legal is a leading provider of personal injury legal services. Our team have a successful history in helping people to pursue compensation for injuries they have suffered as a result of being in an incident on the UK’s roads. We always work with our clients, keeping them involved in the process and providing pragmatic, practical guidance on what is needed to secure the maximum level of compensation that is possible for their circumstances. If you want to speak to someone about how much traffic accident compensation you could be due, who you can trust to treat your case as a priority, please contact the team at Friends Legal today and talk to a road accident claims specialist.